Whether you're walking around the Weston Reservoir or through the historic downtown, Weston is one of those New England towns that feels like a piece of perfection. 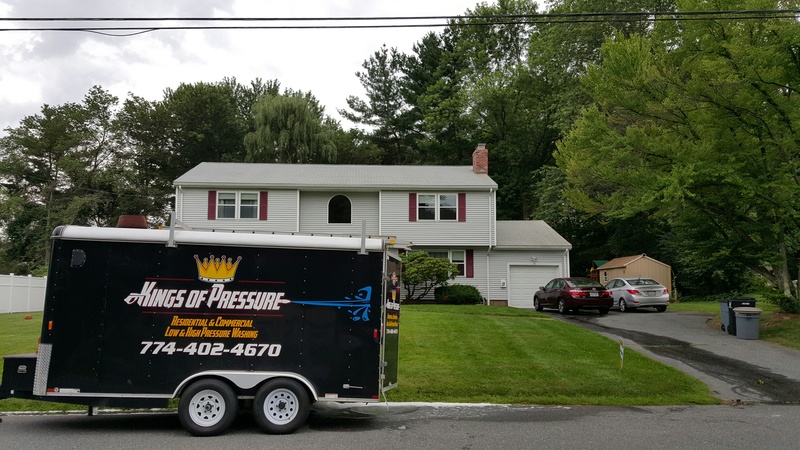 It's a special place to live - and Kings of Pressure delivers exterior cleaning and pressure washing that puts the "home sweet home" in your property! Your home is an investment. It's a comfort. And it should be a long-term benefit to you and your family. With expert care from Kings of Pressure, your home will be ready for long-term success. Our team specializes in "one stop shop" service. This means that you're getting all of the exterior cleaning solutions your property will ever need - and all from one professional source. Advanced cleaning technology. We invest in the most modern power washing and soft washing equipment. Combined with top-of-the-line cleaning products, you're getting the best service out there. Complete stain removal. Stains don't exactly add value to a property. Our team takes a detail-oriented approach to cleaning to ensure that these imperfections don't bring down your property. Professionalism. All of our technicians are certified, extensively trained, and come with the on the ground experience to deliver the highest level of care to your property. Peace of mind. As a fully licensed, bonded, and insured Weston pressure washing company, you're getting true professionalism when you choose Kings of Pressure. Kings of Pressure is your local Weston property services company. This means that we know exactly what your exterior needs to succeed in our climate - we have always lived and worked in Massachusetts, and we build our business around it. Convenient scheduling: Our team offers flexible scheduling so that your property gets the care it needs when it needs it. Affordable pricing: We take pride in offering fair pricing for all of our pressure washing solutions. It's a rate you can get behind - and the best quality, too. Satisfaction guaranteed: For us, this one is simple. You deserve results that you can count on. Our team is here to ensure that we meet your expectations. Our soft washing service removes dirt, mildew, mold, and other eyesores from your siding. Using low pressure washing, this process is as safe as it is effective. Black streaks are a thing of the past with our roof washing solution! We turn to soft washing to erase stains and kill mold and moss growth on your shingles. From dirt to chewing gum, from grease to pollen, our team has your hardscapes covered. We use pressure washing to clean your sidewalk, patio, driveway, and other surfaces. We erase black stripes from your gutters to restore curb appeal! Our technicians carefully wash your gutter system to remove "tiger stripes" from the surface. With regular power washing and professional care, your deck, porch, and fence will always be an asset to your property. With pressure washing and soft washing to support us, there's no exterior surface that the Kings of Pressure team can't clean! Count on us to protect the curb appeal and value of your Weston property!